The Avaya-Tenovis Integral 5 platform for small- and mid-sized businesses is available in an Advanced or D version for up to 56 users and a Professional or E version for 120 users. Integral 5 D is an entry-level system that supports analog and digital telephones and a good selection of telephony features, including station hunting, answering machine, integrated voice mail system, door opener function and more. 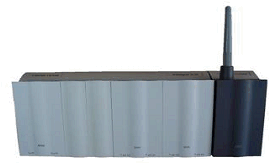 Integral 5 E offers increased capacity to 120 ports and more advanced functionality, including Voice over IP. Modular design eases the migration from the D to the E solution since only the base module must be replaced. In 2004, Avaya Inc. acquired Tenovis GmbH & Co. KG, a German provider of enterprise communications systems and services for small and medium businesses in Europe. More advanced functionality is available with the Integral 5 E, including Voice over IP, networking and call center options. VoIP networking is available, as well as the Integral 5 IP gateway (40-channel IPU module) for branch office phones to connect directly to the IP network (Ethernet 10/100Base-T); no additional PBX cabling is required. H.323 is supported, as well as G.723.1, G.711 and G.729a codecs. Integral 5 E can be part of a Virtual Private Network (VPN) via the ENET protocol, and Integral 5 E systems can be networked via QSIG with basic feature transparency. The BCC Office call center package (optional) provides automatic call routing, skills-based routing, automatic display of customer statistics and data, computer-based voice dialog for welcoming and sorting incoming calls, music on hold and more.